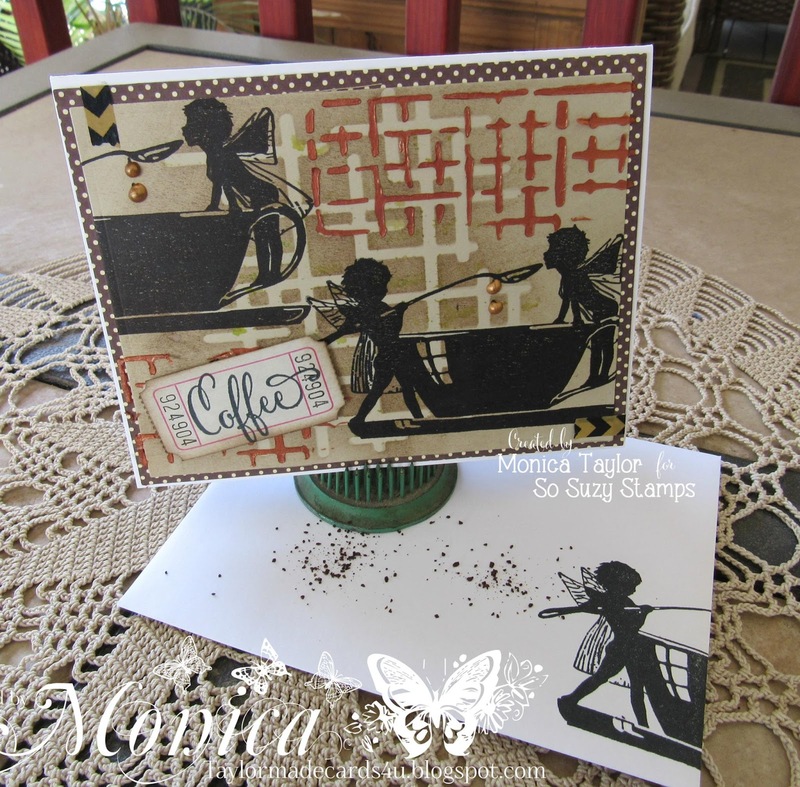 A bit about So Suzy: So Suzy Stamps is based in the four corners region in New Mexico. Suzanne aka Suzy runs the business with a lot of sass, a ton of snark and quite a few laughs mixed in with her red head attitude. So Suzy Stamps is known for creating fun and snarky stamps to help you say the things you wouldn't necessarily say out loud. All right, ready? Coffee cup full? Let's do this! Anyone who has ever spent more than five minutes with me will tell you that my blood type truly is coffee. My dear friend Mary still tells the tale of how I drank my weight in coffee while we were road tripping - I simply remind her that she doesn't want to see me on decaf. The cute die is, tragically, from a company that shut down last year (Top Dog Dies) but that Blood Type stamp is all Suzy! I realized when I was done that I went waaaay outside my 'usual' card style - me? Hand-stitching? Who'da thunk it?? 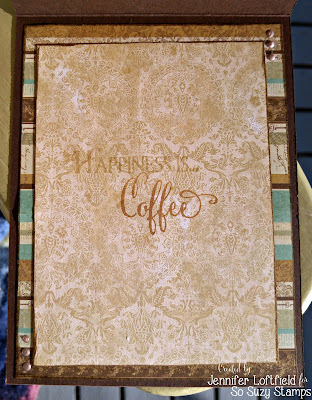 The inside turned out just as cool - the Happiness is... stamp is one of the most versatile in the shop, and I just adore pairing different sayings with it. In this case, it had to be Coffee! 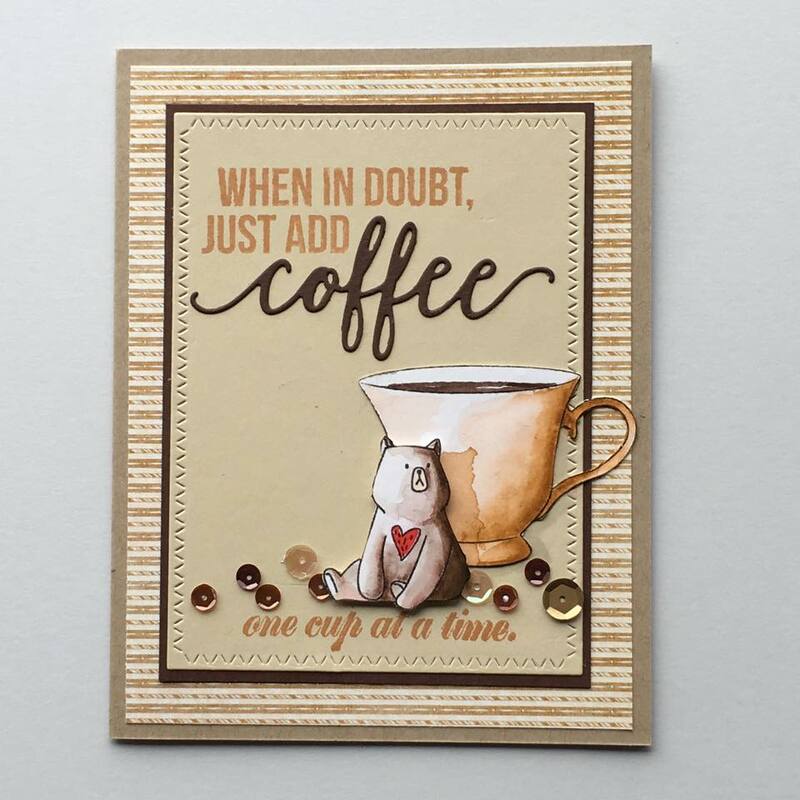 A few drops of the new Antique Gold Nuvo Crystal Drops and this card is ready to send to a fellow coffee lover. 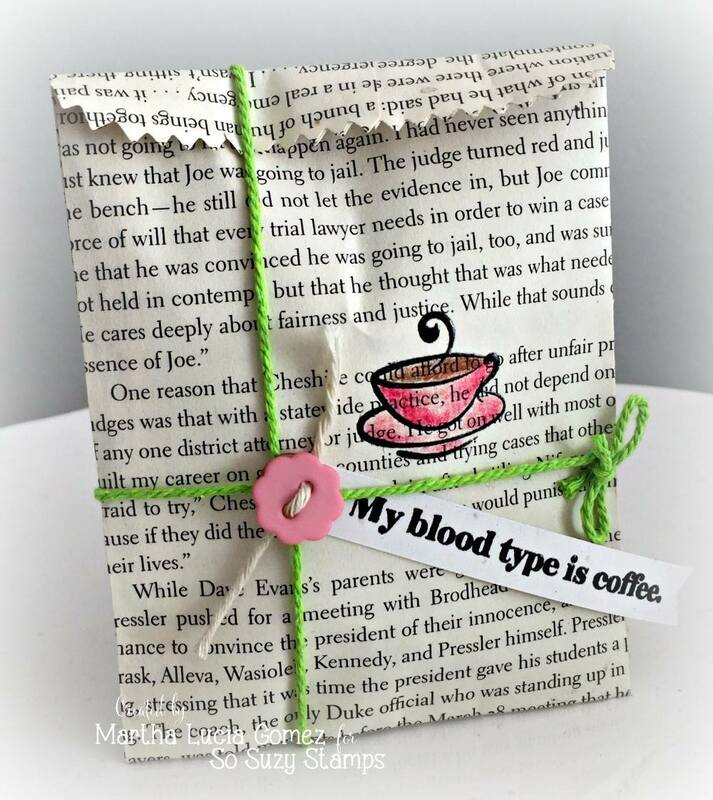 Speaking of coffee...Suzy's mama makes the cutest bags in the whole wide world. We all love our Bunkie Bags, and Mama Denise whipped up some extra special coffee & tea ones just for the hop! They're all one-of-a-kind though, so snag your favorite while it's still there. Some of my teammates joined in on the fun of this hop as well! Take a look at what they created, and please click on their names to head on over to their blogs and leave them some caffeinated love! Thank you so much for stopping by today - I cannot wait to see all the fabulous coffee cards! 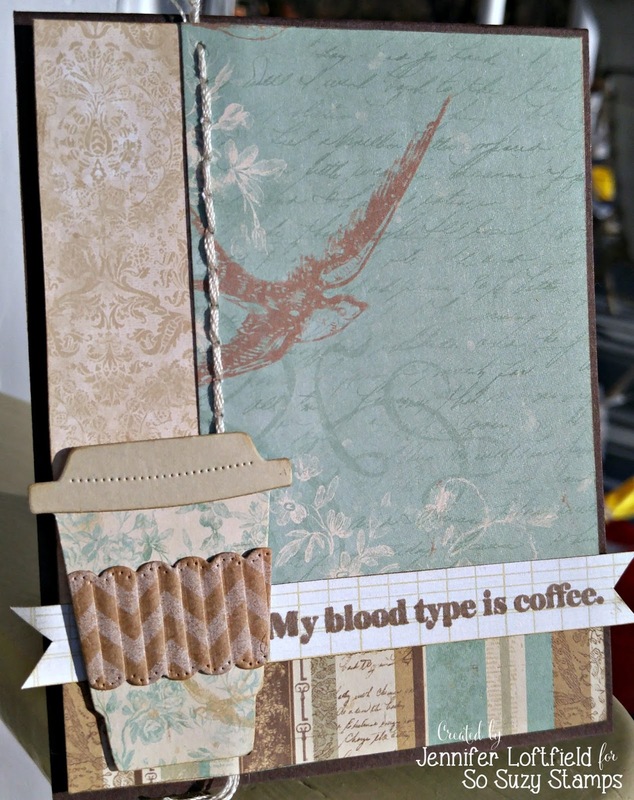 Be sure to check out all of the So Suzy Stamps Coffee goodies, and check out our Design Team Call while you're here. wow! Check out all this awesome inspiration!!!! Love all the awesome projects...you guys have been busy creating for this day! Thanks for being a Super Sponsor! Happy Friday! Wow!!!! You ladies are ON FIRE!!!!!! Way to go! Awesome cards, designers!! Thanks for sponsoring! Thanks for being a sponsor of the hop! Awesome cards by the DT. I mean, really, Awesome! Can't even pick a favorite. Beautiful jobs, ladies! Thank you for your inspiration. What a fab collection of projects! They are all so ADORABLE! 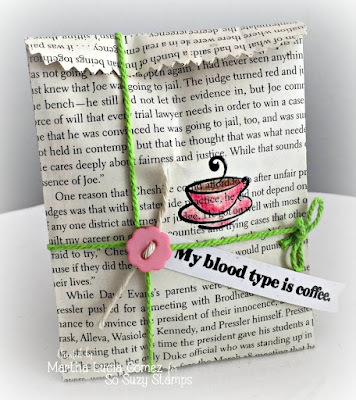 thank you for sponsoring coffee blog hoop! 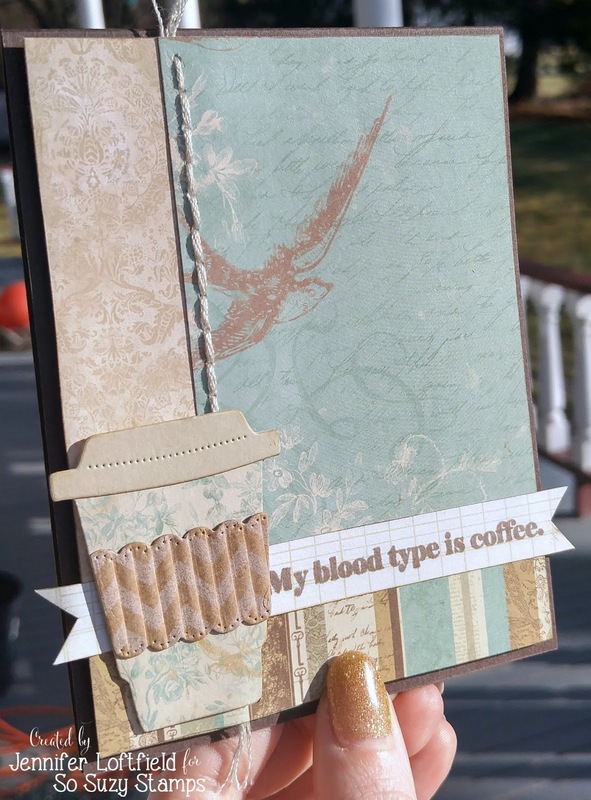 Wow, awesome cards and other projects...I'm going to have to stop back and see some of the DT blogs...Thanks for being a Super Sponsor for the Spring Coffee Lovers BlogHop. So many wonderful projects,cards and I LOVE the bag!! Lots of inspiration in those cards and thank you for being a Super Sponsor. love the soft colors and great textures. wow--these cards are amazing! thanks for sponsoring! Such wonderful projects! Thanks for being a Super Sponsor. Thank You for being a Super Sponsor! You guys totally rocked it, each and every one! So glad Suzy is a sponsor! What a pretty card and such fun sentiments! Thanks for sponsoring the hop! Such fun cards! Thanks for being a sponsor. Thanks for being a sponsor and thanks for sharing your Projects! Fabulous cards and I love that sweet little bag! Oh goodness, how fun are those! The sentiments are just awesome. Thanks for being a sponsor! Great cards. Jen, I love all the details of your card. So pretty. Thanks for being a super sponsor. Oh, super fun projects!! Thanks so much for being a Super Sponsor and making this hop even MORE fun!! Wow! Love all of the cards and projects and the bag is sooo cute! Thanks so much for being a sponsor! lots of inspiration, thanks for sharing and sponsoring! What beautiful cards ladies! Thank you so much for sponsoring!!! Such fun to look at all of the lovely creations here! Thank you for sponsoring the challenge - I look forward to creating! Fabulous cards and projects from everyone! Such inspiration! Lovely projects. Thanks for sharing and sponsoring. What wonderful cards!! Thanks so much for being a sponsor of this amazing blog hop! Thanks for being a Coffee Lovin’ Super Sponsor. Jove all the wonderful projects. Thanks for sharing. Wow! So many great projects! 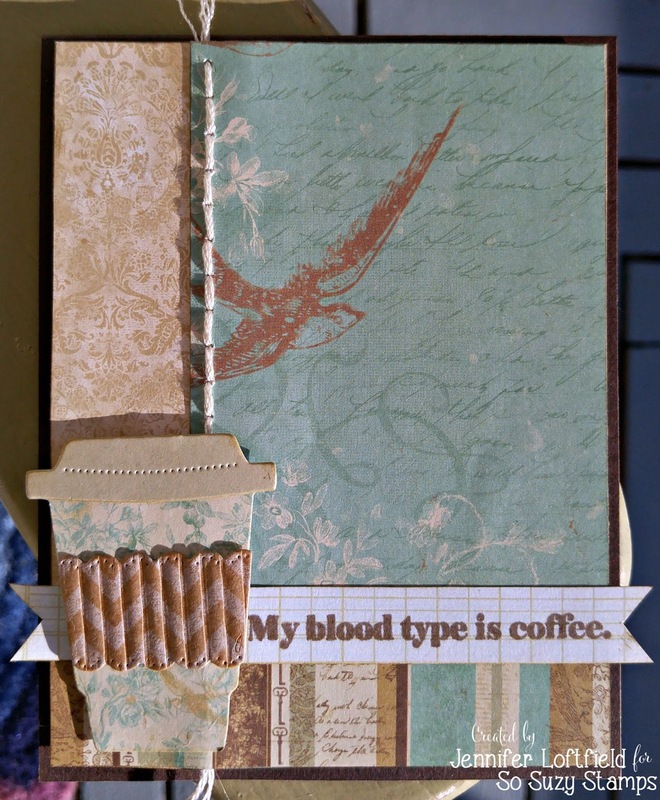 I love that "My blood type is coffee" sentiment! Thanks for being a super sponsor of the hop! THANK YOU for sharing your CREATIVE INSPIRATION EVERYONE!!! Really fun projects from the DT! 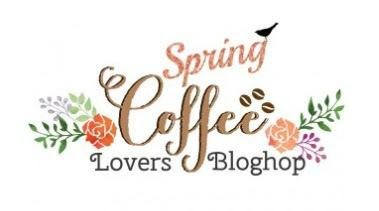 Thanks for being a Super Sponsor for the Spring Coffee Lovers Blog Hop. Great projects love all the coffee. So much fun! I love all this coffee inspiration! Amazing! Awesome DT projects! Thanks for being a sponsor of the hop! I just wanted to stop by to say a big THANK YOU for being a Super Sponsor for the Coffee Loving Cardmakers Blog. This is a big event, and it wouldn't be possible without awesome and generous sponsors like you. I pray that you will be blessed in return for your act of kindness in the crafting community. It's greatly appreciated. Awesome projects! Love the tote bag! Creativity runs in the family! Love your snarky card and your momma's bags are AWESOMESAUCE! Thank you so much for sponsoring the hop and helping to make it even MORE fun for us!